Work that is submitted for jurying must be the original creation of the craftsperson, not produced by employees, and be at least 70% hand crafted. 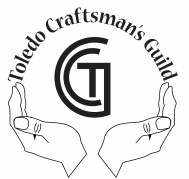 To become a Member of the Toledo Craftsman’s Guild, your art/craft must meet the standards set by the Jurying Committee and will be evaluated for: Originality (1-5 points), Quality (1-10 points), and Appearance (1-5 points). You must receive a total of 14 points to be accepted as a member. If accepted for jurying, you will be notified by mail or email prior to the jurying session. Invitations for membership will be sent out in the order that the applications were received.